A house concert is a concert in a living room. They’re happening more frequently as artists find that 25 to 40 people can fit into a living room quite comfortably. There is much less overhead, no smoke, low or no amounts of alcohol to compete with, little advertising necessary and cover charges can be whatever the artist and presenter want. Before you start to think that this is something that only amateurs do, think again – you’d be amazed at the quality and notoriety of artists that do or have done house concerts, even when they were filling clubs and getting airplay. 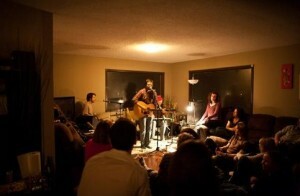 Often artists who play house concerts will have a show at a coffeehouse or club the same week or weekend. Imagine seeing Dar Williams or Lyle Lovett in your living room the year before they were playing large halls. It happens. It’s best to start planning at least two months in advance, once you’ve started speaking with artists, though some folks do it in a month. Some people treat their concerts as an ongoing series and will book the artists a year in advance. You’ll want to ask yourself honest questions about how much time you’ll want to spend presenting house concerts. If you have a difficult time with deadlines, the time to establish methods for overcoming this difficulty is BEFORE you book anyone. Keep in mind that touring artists live by their performances. Take your commitment seriously – a low turnout is like showing up for work and having your boss inform you that today you’re working for less than minimum wage. Not fun for anyone. That said, it’s usually a good time for all concerned. Like many good things, sometimes a little work is involved. You probably have some idea of who your favorite small time artists are already. You may have heard them on a community radio show, as a local opening act for a touring artist, at a fair or festival or even at a another house concert. Other sources for house concert artists are non-profit arts groups, web sites or booking information on the back of a self produced CD. Now that you’re in contact with the artist and he/she/they are excited about doing a show in your living room, it’s time to work out your arrangements regarding who gets how much of what money that is generated, where will the artist be staying, food needs, how “public” you want the show to be. Make sure all of this negotiated ahead of time with the artist, preferably in writing. We’ve chosen NOT to make the presentation of house concerts a business. (Though that doesn’t mean we’re not business like – anywhere money is involved, it’s best to keep things orderly) We usually don’t take anything but mailing expenses. For us, presenting house concerts is a labor of love. We enjoy getting to know some of the artists we present by having them stay with us for a day or three on their tour. Our experience shows that Saturday nights are best, but other nights can work out well if things like rush hour, and early next work days are taken into account when it comes to deciding start times. The most important factor is that the show is advertised as a “sit down concert” – audience expectation will be the difference between having a party with some poor fool making barely audible noise in the corner and having a concert that changes peoples lives. Our invitations are a mix between a postcard and a “party” invitation. We put some kind of interesting graphic on the front with an inviting scenario and then the vital information on the inside in larger type. Art doesn’t happen until it passes between people. Come and Participate! This will be a non-smoking, low alcohol event. It will be held outdoors (weather permitting) If you’re allergic to cats you might want to ingest antihistamines or leave your nose at home. Please RSVP to Chris at (206) 555-5555 or Betsy at (206) 555-6666 and let us know how many will be in your party. Make a list of your closest 50-100 friends and their addresses. Then make a list of another 50 people you know who you’d allow into your house who you think might want to see this particular artist. Our experience is that we get a 20 to 25% turn out. We’ve been doing it long enough that we have a fairly educated audience, people know what to bring and how to behave. We recommend little or no alcohol. People tend to not realize they’re being loud when they’re drunk. Send your mailing out 3 weeks in advance (Two weeks in advance at the latest!) to the 100 to 150 people on the list. Getting the invitation into the homes of your audience with enough time to plan to attend is the most important aspect of the advertising! We’ve found that if we send the invitation too early, (more than three weeks in advance) people tend to forget about the show. Too late (less than two weeks before the show) and people have made other plans. Take delivery time into account. A piece of mail in town will take form one to three days to be delivered. We assume the longest. It doesn’t have to be fancy – a 4X5″ postcard with the essential information will do. This $30 – 50 dollar expense can be taken from the hat or can be given as your donation. Think about how much you might spend on party – some of my best friends might spend fifty dollars on alcohol alone. Be sure to include directions to your house/apartment, your phone number, the date and time of the show, information about food, the amount of donation you expect, artists names, “IN CONCERT” etc. We’ve found that providing drinkables and some munchies before the show, with a potluck AFTER works best for feeding people and making the music happen. If you’re short on chairs, request that people bring folding chairs or pillows. We usually end up with a half circle of devoted (and limber!) fans at the feet of their favorite artist. It’s never been a problem for us. We create a stage in the corner of our living room by putting a guitar stand there in a way that says “This is the performance space.” We set the stage as if the musicians are story tellers (they often are, they just sing their stories) and they deserve the same amount of attention as if we were sitting in a theatre about to see a play. THIS STUFF IS NOT BACKGROUND MUSIC – IT’S THE FOCUS OF THE EVENING! The method that seems to work best for us (and it’s not the only way by any means) since we usually don’t charge a “cover” is to suggest a donation between $6 and $15 dollars in the mailing , (more if you can, less if you can’t) and pass the hat just before the fourth song before intermission or the end of the show if there is only one long set. It’s vital to do this during the first set – you want to make sure that everyone who comes has the opportunity and encouragement to give what they can. It’s important that the MC (that usually means YOU the presenter) get up, SEEDED hat in hand (we have a “lucky hat” just for this purpose) and announce that the artist(s) who has given us so much this evening lives by his/her (their) art, and that if we want to see more of these events we need to give in return financially. I usually remind people of the last time they saw a show with some “name” artist, they probably paid 20 to $25 dollars, and that our artist is as good or better, and you saw them so up close you can shake their hand. As performers, we’ve often made more money on house concerts than at coffee house shows with the same number of attendees. That allows for people who may not have money to attend, and for people with money who want to contribute more to participate at their level. People give more when they are excited. Have a jar placed strategically for stragglers, people who need change and check writers. The hat or jar should have sign suggesting a donation of at least $6-$15. We also provide a place for the artist to sell their CDs and tapes and to provide a mailing list. Since Suddenly Naked keeps it’s own list, we try to centralize the list for the evening’s show and mail a copy to the artist after it’s entered. Do the follow-up ASAP. As an artist doing house concerts, we’ve NEVER performed a house concert that didn’t have someone ask us if we’d like to do this at their house. It’s a great way to build an audience, and folks who see you at house concerts bring their friends when we do the club dates. As an individual wanting to be more involved in the music community (or beginning to build our own!) it’s a great way to meet folks of like mind. Decentralize the music industry – support independent artists!